Poverty is a global issue. The vast majority of the world’s wealth is in the hands of the elite. Poverty is spreading. It cuts across all cultures, regions, and worldviews. Poverty impedes progress. Humanity could grow stronger if the concept and condition of poverty were appropriately addressed. And all people were allowed to participate equally. But first comes personal responsibility. 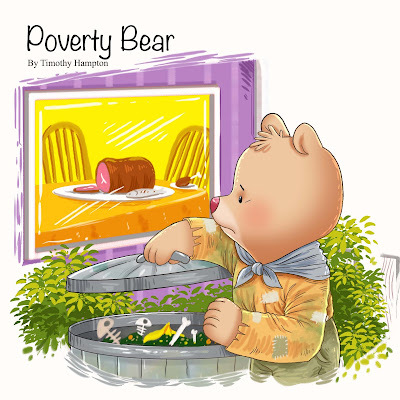 Poverty Bear is a book about personal responsibility. Its goal is to teach the reader, in very simple terms, how poverty can and should be avoided. Poverty Bear’s journey also helps the reader to recognize how an individual might become susceptible to poverty. It’s hard to imagine a world without poverty. It’s even harder to imagine that anyone would actually want to be poor. Poverty Bear was not written as the solution to world poverty. It was written to expand the dialog. Understanding and eliminating poverty are tasks for all humanity. Which means, poverty’s most innocent victims should be included in this discussion.